Click here to find the perfect cat waiting for YOU at Cat Depot. Want to find your perfect match 'on the go?' 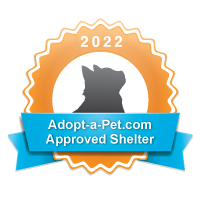 Download a FREE Petfinder app and instantly search for a special cat or pet in your area. Click on the links below to download to your mobile device! Cat Depot provides a safe haven for a wide variety of kittens and cats (125+ of all ages, sizes, breeds, and colors), until they are adopted into loving homes. We house and care for motherless kittens, abandoned, abused and neglected cats, stray cats and kittens, relinquished cats, and cats with special needs. Before selecting a cat, we ask that you keep in mind that a pet is a lifelong commitment. Cats that reside indoors or in an enclosed outdoor environment live 15–20 years on average, and they want and need to be part of your family that entire time. Cats of all ages have different needs and adapt best to home environments that meet those needs.There are so many cats out there, and so many kinds of cats to choose from, it can be hard to know where to begin. The answers to some of these questions may lie in your own lifestyle. Are you a couch potato who wants a cat to nap along with you? Do you hang on every fascinating word a kitty says? Is kitten-watching more fun than TV? Kittens are adorable, curious, playful, and full of energy. They can also be exasperating at times, demanding lots of supervision to keep them out of trouble and patience when they get into it. And a kitten is an unknown entity—you really don't know what kind of cat you'll end up with once she outgrows her kitten personality. Some cats are very mellow and will tolerate any kind of handling, including being dressed in clothes. These cats are perfect for young kids or older people who want and appreciate this type of cat. Other cats don't like being picked up or held and will only come to you for petting when they feel like it. There are cats who live to nap and cats who are perpetual motion machines. Personality can vary widely by breed, too. If you decide you want a purebred, do your homework so you end up with one that's right for you. Persians, for example, are typically laid-back and sedentary, while Bengals and other "exotic" breeds (created with wild cat genes) tend to be extremely active. Siamese have the reputation of being very talkative. This is mainly a matter of preference and your willingness to devote time to regular grooming. Long-haired cats require frequent grooming sessions to prevent matting Not all cats enjoy being brushed, though, and you could wind up having to take your long-hair to a groomer to be shaved down. Short-haired cats don't require as much brushing, but it helps to remove loose fur, stimulate the skin, and distribute oils through the coat. A cat who likes being groomed will come running when she sees the brush. There are far fewer cat breeds than dog breeds. Most dog breeds evolved from the type of work they were meant to do., Cat breeds were developed mostly for companionship. So there are fewer personality differences between cat breeds. Many cats with special needs make wonderful companions. They might be older, deaf, blind, or have an illness that requires regular medication. Their condition doesn't affect the amount of love and pleasure they have to give; it just means extra commitment on your part to meet their needs for the rest of their lives. If you already have pets, you have to consider them as well before bringing home a cat. Some cats may be perfectly happy as an only cat and could really resent a newcomer. The more cats you have, the more potential problems you invite; the cats can become stressed and develop undesirable behaviors such as spraying urine, fighting, or hiding. Dogs and cats can become best friends, but some dogs with a high prey drive may not be able to resist chasing, terrorizing, or even killing the new cat. Click here to find your perfect cat waiting for YOU at Cat Depot.